A short walk along a narrow path takes you away from the sounds of cars and motorbikes into the magical gardens of 'Villa Semua Suka', which means 'everybody likes'. 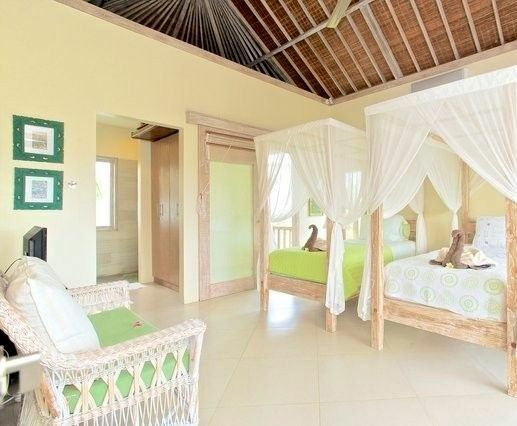 Hibiscus Suite is the second story of Semua Suka, and has two twin beds, and a full bathroom with shower. There are 2 balconies that open up to cool rice field breezes and views, plus a daybed, sofa, armchairs and a small desk. The outdoor veranda, swimming pool, gazebo and garden are all part of your living area. Your room includes air conditioning, WiFi, a new flat-screen TV with DVD player, IPOD player and our gourmet breakfast which includes house made bread and jams, fresh fruit, choice of eggs, pancakes, etc. and of course great Bali coffee. You will be well cared for by our staff led by Made' Pia who can also can help with arrangements for day trips, rafting, downhill biking, cooking classes, etc. Only 5 minutes down the path is a great yoga studio, 4 small restaurants, massage spas and a full-size supermarket. We are also a 20 minute walk from the center of Ubud, the cultural heart and soul of Bali. Or you can take a taxi, rent a motor bike or bicycle. You will be vacationing in the lap of luxury at budget prices--enjoy the gazebo, swimming pool and lounge chairs with WiFi throughout the property.